You may just be starting the blog hop or may have come from Rose Ann Marr's blog. You can follow the full blog hop lineup below to move along from blog to blog, so you can see all of the new projects. I don't typically do black and white cards with just one accent color, but it is a fun challenge! For my one accent color I chose Cherry Cobbler. Dry Embossing vs. Heat Embossing. 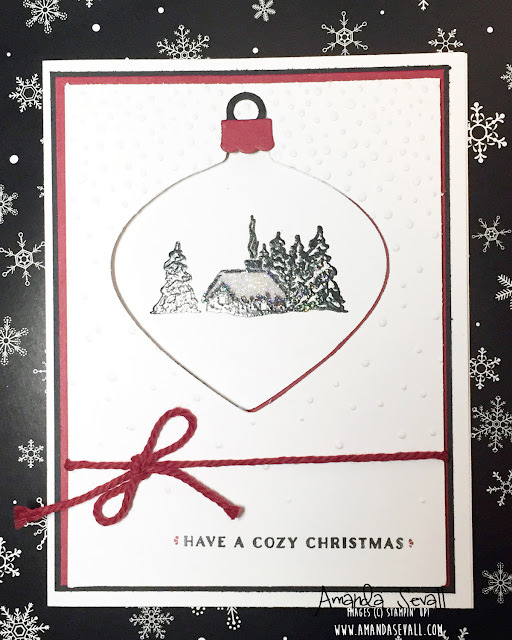 I used both on this card -- the snow on the front is dry embossed and the house with trees is heat embossed. The dry embossing gives the paper texture by forming it into a shape using pressure. The heat embossing is created using watermarking ink (Versamark) and embossing powder, which is then heated to melt and seal your image to the paper! I love using both techniques and they really add a lot of interest and dimension to your cards! Die Cut "Windows". I love the end look of using this technique! All you do is die cut whatever shape you'd like into the front of your card and then stamp your image on the inside of your card through that window! So simple and such a great effect. Using Only One Color. It is an easy way to get a simple, graphic effect for your projects and makes it easy to assemble multiples of the same card design on a budget -- less supplies to buy too! So elegant! I love the window and all the embossing. 365 Cards: Happy Birthday... Hope it's Sweet! 365 Cards: Have a Cup of Cheer!